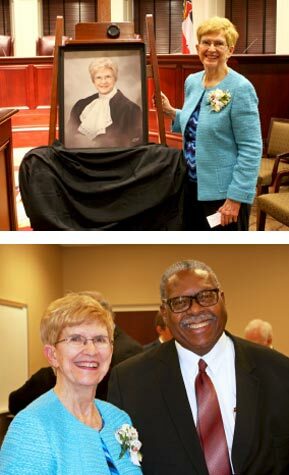 Retired Court of Appeals Judge Mary Libby Payne, who inspired and mentored several generations of lawyers, presented her portrait to the court in a ceremony on Nov. 8. Judge Payne, of Pearl, was the first woman to serve on the Court of Appeals. She was one of the original 10 members of the court, which began work in January 1995. She retired July 31, 2001, after serving for six and one-half years on the appellate court. Judge Payne said, “There are so many of you here who blessed my life that I can’t go around the room and tell you particularly.” She recognized her son Glenn Payne and cousins, Stennis Institute of Government Senior Policy Analyst Lydia Quarles, Mississippi University for Women President Nora Miller and several members of a group of about 20 talented young women lawyers whom she called the Dragon Slayers. Dragon Slayers at the ceremony were Madison County Court Judge Staci O’Neal, marketing director Alana Miles, former law clerk Mary Pentecost, and former Parole Board Chairwoman Shannon Warnock, co-manager of Judge Payne’s 1994 election campaign. Pentecost, who served as Judge Payne’s law clerk immediately after graduating from law school, said she “was a trailblazer in everything she did,” but her most memorable attribute was spiritual. Judge Payne was a mentor and friend who prayed with her and offered wisdom and encouragement. Chief Justice Bill Waller Jr. may have known her the longest of those outside her family. “She was my training union teacher when I was 11,” he said. Of her many accomplishments, Judge Lee said, “She had so many awards and plaques in her office, you could not tell what color the walls were.” When she moved to another office, he joked that her former corner of the building rose. Among the awards that Judge Payne received are the Susie Blue Buchanan Award from the Women in the Profession Committee of the Mississippi Bar in 2000, the Christian Legal Society's Lifetime Achievement Award in 2002, the Mississippi State University Pre-Law Society's Distinguished Jurist Award in 2004, the Mississippi Bar's Lifetime Achievement Award in 2005, the Mississippi Women Lawyer's Lifetime Achievement Award in 2010 and the Governor's Medal of service in 2012. She is a pacesetter in Southern Women in Public Service. She served in all three branches of state government. She was a legislative draftsman, executive director of the Mississippi Judiciary Commission and assistant state attorney general. She was hired by then Speaker of the House Walter Sillers to be a House Legislative draftsman during the Legislature's Biennial Sessions and in 1970, when the House Drafting Office was created, she was employed to lead the new office as the first chief of drafting and research. She became founding dean of the Mississippi College School of Law in 1975. She also served as associate professor, full professor, scholar in residence and professor emerita. Former colleagues and staff recalled Judge Payne as intellectual and funny. On viewing a Picasso at an art museum, she was heard to remark that the model must have been insulted. She was distinct in her manner of dress – feminine and colorful among the dark business suits. She drove a large green Lincoln Towncar, and her driving was the stuff of legend. Justice King, whose old office faced the parking lot, said it always sounded like she accelerated rather than braked. Justice King, another of the founding members of the Court of Appeals and the first African American judge on that court, shared a bond of friendship with Judge Payne. They sat together during En Banc discussions of cases. “We were jokingly referred to at our end of the table as the court’s minority corner,” he said. Justice King noted that Judge Payne finished first in her class in law school. “But despite her outstanding academic performance, gender bias limited her job offers to legal secretarial positions,” he said. Hard work brought her success in the Attorney General’s office, as a legislative draftsman in the House of Representatives, and as founding dean of Mississippi College School of Law, he said.